Find out more about regular stallholders from the Farnham Farmers' Market. 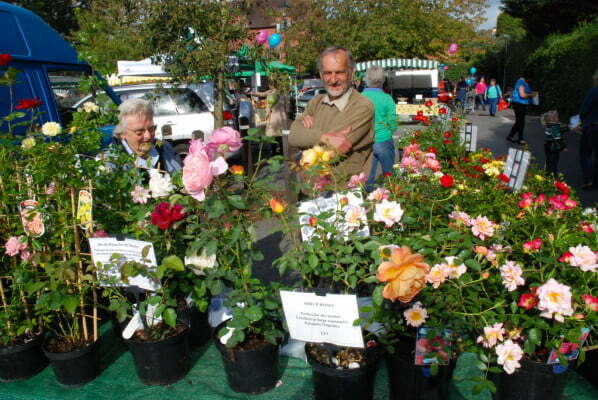 Meet regular stallholders from the Farnham Farmers’ Market. Twenty-five years ago, a fruit farm in East Sussex was battered by a violent hailstorm. Farmers Chris and Lesley Dench were left with hardly any saleable fruit so in an attempt to make the best of a bad situation, they decided to ask a local vineyard to make a batch of apple juice from the fruit they had managed to salvage. The juice sold better than expected and so this marked the beginning for Ringden Farm apple juice. Ringden Farm now sells over 20 award-winning single variety apple juices. They also offer several different apple juice blends such as thirst-quenching apple and rhubarb or the refreshing sweet and sour apple and plum. Ringden Farm juice is 100 per cent natural: it has no added sugar, water, colourings or preservatives. Traditional pressing methods and slow pasteurisation preserve the flavour of the apples. For a drink that tastes good all year round, visit Ringden Farm at the Farnham Farmers’ Market. Anila’s Authentic Sauces attend Farnham farmers’ Market every month. They sell eight varieties of curry sauces, 16 varieties of chutneys, pickles, dips and snacks such as samosas, lentil slice and Bombay mix. Their award-winning products are made in small batches using only the finest ingredients and traditional family recipes giving home-made flavours and tastes as ‘Mum makes’. The products are free from sugar, dairy, gluten, onion, garlic and preservatives, they are also ideal for those with food intolerances to create authentic curries simply and easily. Anila’s Authentic Sauces also attend other markets in Guildford, Walton, Cobham, Surbiton, Wallington, Reading and Newbury. See Anila’s website for recipes and inspiration. Collaroy Farm sell extremely fresh, free range eggs. They attend every Farnham Farmers’ Market and can also be visited at the markets in Guildford, Milford (Secretts), Horsham, Epsom and Wallington. Whether the weather is hot or cold, children and adults flock to Dylan’s ice cream van at the Farnham Farmers’ Market. Farnham Town Council met up with Ben to discover what makes the ice cream so popular. Dylan’s ice cream was founded by Ben Govier and is named after the family’s much-missed black Labrador. Ben has been making ice cream since he was a boy and uses only the freshest of ingredients to make the best possible ice cream. Much of the fruit is sourced from local growers – strawberries come from Bishops Waltham, blackberries from a smallholding in Guildford and rhubarb from Ben’s Mum’s allotment. The milk comes from a farm in Froxfield and the sugar is British-grown beet. The ice cream on offer changes to suit the season. Naturally ripened fruit gives the ice cream an intense delicious flavour, which conjures up fond memories of long summer days or beautiful, crisp winter mornings. Ben’s mission is to make the best ice cream using natural ingredients and local produce to make unique flavours. If you have an idea for a new flavour, let Ben know and he’ll be happy to give it a try. Ben has been attending the Farnham Farmers’ Market for several years. He plans to be at the July market along with supplies of tayberry ice cream but be quick as the fruit is only in season for two weeks! Visit the Dylan’s ice cream website for more information about their ice cream parlour at Haslemere or to book a Dylan’s ice cream van for an event. Fruityfoods make a selection of quality award winning products such as jam, marmalade, chutney and salad dressings. They attend Farnham Farmers’ Market every month and can also be seen at Artisan, Milford, Godalming, Guildford and Grayshott. See Fruityfoods’ website for more information about their products. Flax Farm Ltd sells UK and organic linseed which is also known as flax. Other products that they sell are cold-pressed linseed oil, freshly ground linseed, linseed porridge/muesli and Flaxjacks cakes made with linseed. Flaxjacks have all the health benefits of linseed and are gluten-free. Linseed contains omega-3, fibre and supports healthy heart, joints, skin, digestion, hormone balance and immune system. Find out more about Flax Farm Ltd and their products. They also attended markets at Epsom, Kew, Wallington, Walton and Guildford. Hunts Hill Farm sell beef, pork, chicken, duck, lamb and veal. They also sell duck, chicken and goose eggs. The farm is situated five miles from Farnham and all their meat is butchered at the farm. The Farm shop is open Wednesday to Saturday. Hunts Hill Farm attends the Farnham Farmers’ Market every month and markets at Ripley, Guildford, Milford, Haslemere, Walton, Cobham and Kew. Sites are chosen based on their unique benefit for the bees. Each have something special for them to work. Each season they also take around 35 – 40 hives to the New Forest where they harvest a crop of heather honey for which they have won National Honey Show awards. Mrs B’s Bees has a variety of honey, beeswax candles, furniture polish, beeswax wraps and beeswax sandwich satchels available to purchase at the market or online. Mud Foods sell gourmet pies, pasties, sausage rolls and squiches (that’s square quiches!). They pride themselves on sourcing outstanding quality ingredients from the Sussex Downs and describe their secret recipe for shortcrust pasty as ‘legendary’. Mud Foods attend the Farnham Farmers’ Market every month. They also attend Guildford, Milford, Chichester, Petworth, Alton, Fleet, Winchester, Romsey, Emsworth, Ringwood, Shoreham, Southsea, Petersfield, Andover, Fareham and Kew. Visit Mud Foods’ website for more information. Nut Knowle Farm sell goats cheese at Farnham Farmers’ Market and attend every month. Their cheeses are hand-made speciality ‘Artisan Cheeses’ from a small Sussex Dairy. Shoppers may taste each variety at the market. Nut Knowle Farm also attends other markets in London, Surrey and Sussex. See their recipe of the month. Ollo Foods offer a mixed stall selling Indian sauces, pickles and food to go. The food is vegan and is based on Indian street food culture. They also have frozen curries that are very popular. Other foods on offer are a gluten free, vegan stuffed crepe called a Dosa which they make to order and baked vegetarian Samosas which are served warm. Ollo Foods attend every Farnham market and also Guildford, Walton-upon-Thames, Staines and Cobham. They have a number of recipes on their website that they share with customers. The May family has been growing roses at their nursery in Seale since 1948. They specialise in fragrant roses and especially highly scented climbing roses including large plants to give instant impact. All their roses are hand raised which makes for good sturdy plants, which means they grow away strongly when they move to your garden. Catherine and her husband David are RHS medallists and have had 12 wins at Hampton Court Flower Show. Seale Nurseries are returning to Hampton Court at the end of this month. Their display of colourful climbing roses will sit against a mural painted by the local landscape artist Charles Bone. Catherine and David have been attending Farnham Farmers’ Market since it started. They will happily help you to choose the perfect rose for your garden or a gift for a friend or family member. See the Seale Nurseries website for more information or come along to the Farnham Farmers’ Market. Simon’s Pies and Catering sell pies, pork pies, scotch eggs and quiches. The pies are all hand-made at home using locally sourced meat, which Simon believes makes the pies unique to the markets he attends. Simon attends the Farnham Farmers’ Market every month. He also attends farmers’ markets at Walton-upon-Thames, Halsemere, Salisbury Farmers’ and Artisans’ market, Chippenham Farmers’ Market, Canterbury, Grayshott, Milford and Cobham. Find out more about Simon’s Pies and Catering. V J Game and Sussex Smokers sell smoked meats, fish, poultry, varieties of wild boar or venison sausages. The produce is traditionally smoked over oak wood. The game sausages are handmade using fine local ingredients and local wild boar and venison.